As our winter blues begin to melt away we can’t help but look forward to the colors and warmth that spring will bring! With blooming flowers and the leaves making their spring appearance, Cades Cove will once again be clothed in nature’s beauty. When heading to the Smokies for vacation, it’s the perfect time to relax in the mountains. The weather is warm but not scorching and the beautiful pastels of flora paint the ground. With flora also comes fauna! The wildlife that emerges into cades Cove will make for an amazing experience! This is the perfect time for picnics in the fields, as well as discovering your favorite hikes that begin within the Cove. There are so many fun adventures to take part in when spring rolls around. Experience Cades Cove in so many different ways including the scenic drive, hiking, biking, wildflower pilgrimage, and horseback riding! This annual event in The Great Smoky Mountains offers guided hikes on trails through the park to see the blooming wildflowers and other flora. Experience the region’s natural resources in person while being educated through programs this event puts on. Within the programs, you can learn about wildflowers, fungi, and other plants. Besides plants, there are programs offered on insects, snakes, birds, bears, and even photography in the mountains. This year’s Wildflower Pilgrimage will be April 24th- 27th, 2019. Chestnut Top– This trail is great for viewing wildflowers and beautiful scenic views! Brushy Mountain– This trail is great for viewing wildflowers, waterfalls, and more! Gregory Bald– This trail is a great way to see blooming azaleas and mountainous views! Rich Mountain Loop– While adventuring in Cades Cove, take a detour here and see wildflowers, historical landmarks, and more! Biking around the Cades Cove loop is open every Wednesday and Saturday from may to September each morning until 10 am. This is a great way to explore Cades Cove all year round with friends and family right beside you! You can also use this as a way to get some fresh air and exercise! Bikes can be rented at the Cades Cove Campground Store on a first come first serve basis. 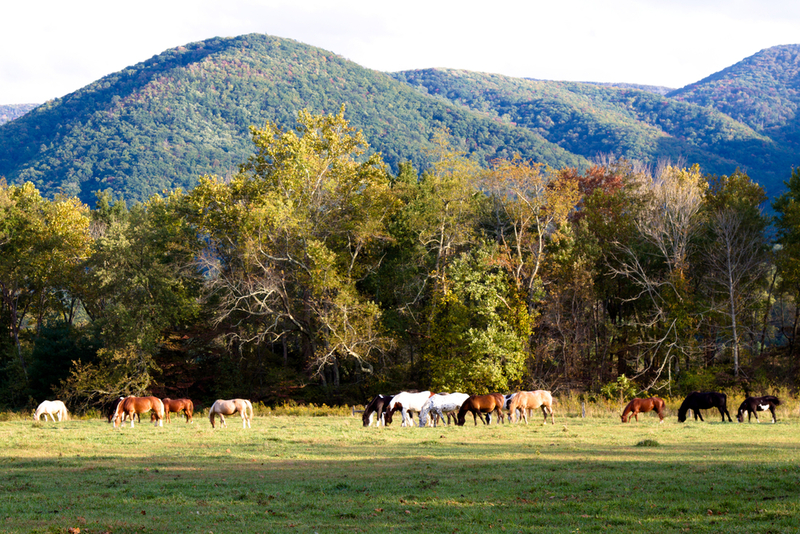 The Cades Cove Riding Stables allow you to explore the park from a different angle! Cades Cove has cleared trails for guided rides in the cove. No need for prior experience, whether it’s your first or 50th ride, you’ll have a great time! Visit http://www.cadescovestables.com/ for more information!